A sample of chlorine atoms (Cl). All atoms in the sample consist of chlorine, so the substance is homogeneous. The earth’s crust consists of 5 main elements. 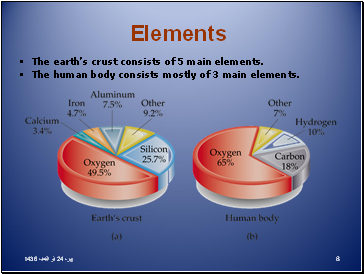 The human body consists mostly of 3 main elements. * Physical states are given at room temperature. 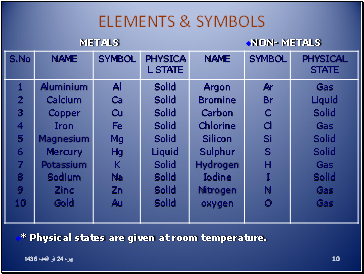 Most elements react to form compounds. 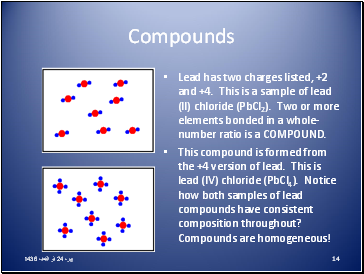 The proportions of elements in compounds are the same irrespective of how the compound was formed. 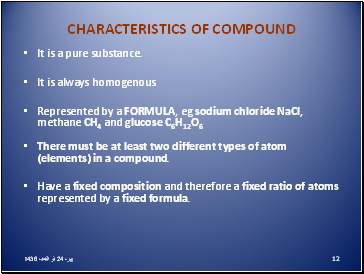 The composition of a pure compound is always the same. If water is decomposed, then there will always be twice as much hydrogen gas formed as oxygen gas. 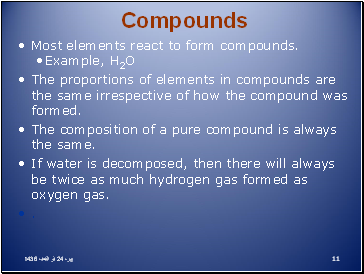 There must be at least two different types of atom (elements) in a compound. Have a fixed composition and therefore a fixed ratio of atoms represented by a fixed formula. 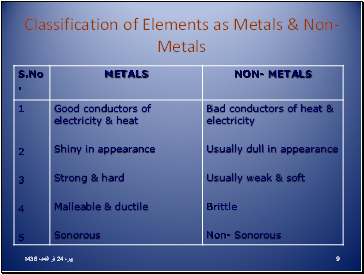 Elements are not easily separated by physical means. 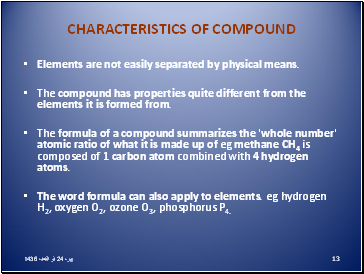 The compound has properties quite different from the elements it is formed from. The formula of a compound summarizes the 'whole number' atomic ratio of what it is made up of eg methane CH4 is composed of 1 carbon atom combined with 4 hydrogen atoms. The word formula can also apply to elements. eg hydrogen H2, oxygen O2, ozone O3, phosphorus P4.